The Mohmand Agency takes its name from the Mohmand Tribe, which inhabits the area. The agency was established in 1951 The agency with the total area of 2,296 square kilometer, is bordered in the north with the Bajaur Agency, in the east with the Malakand protected area and Charsadda district, in the south-east with Peshawar district, in the south with Khyber agency and in the west with Afghanistan. 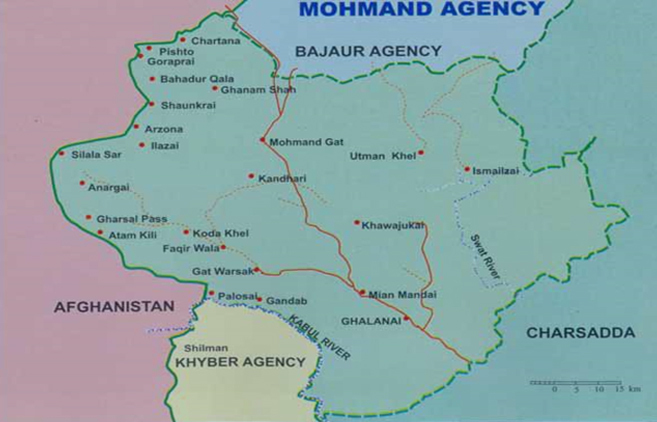 Mohmand Agency is geographically sub divided for administrative convenience into upper and lower Mohmand areas. The agency is divided into seven Tehsils, Halimzai, Painiali, Safi, Upper Mohmand, Barangg Khar, Yakaghund and Ambar. Mohmand Agency is an area of rugged mountains with barren slopes. Most of the area is mountainous, with brown rocky mountains and little vegetation. Land use data from 2007-08 shows that 11.5% of the total geographic area of Mohmand Agency is cultivated, while more than 82% of the land is not available for cultivation. This puts intense pressure on the available agricultural land and creates food insecurity in the agency. The current population of Mohmand Agency is approximately 627,120 (while 334,453 persons as per 1998 census with a density of 146 persons per square kilometer). The annual growth rate of the population was calculated as 4.28.